I had a revelation several years ago while looking at vacation photos. I don’t have to wear shorts again. Ever. In my whole life. I’m short. I’m not skinny. I look terrible in shorts. They creep up my legs all by themselves and become something of a social hazard. I mean, shorts don’t have a whole lot of room to creep places, you know? I did myself and the entire world a favor when I realized that light weight pants and capris and skirts were the wave of my future. I had the same kind of revelation about folding laundry. It was the same in the sense that I realized I don’t have to do it, and you can’t make me. It tells you something about my personality that I’m grinning from ear to ear after typing “I don’t have to do it, and you can’t make me.” Hehehe. We used to use the Clean Pile/Dirty Pile system. In case it’s not already super, duper, extra obvious, that’s the system where you dump all your clean clothes into a pile and then, when they get dirty, you put them into a separate, dirty pile. 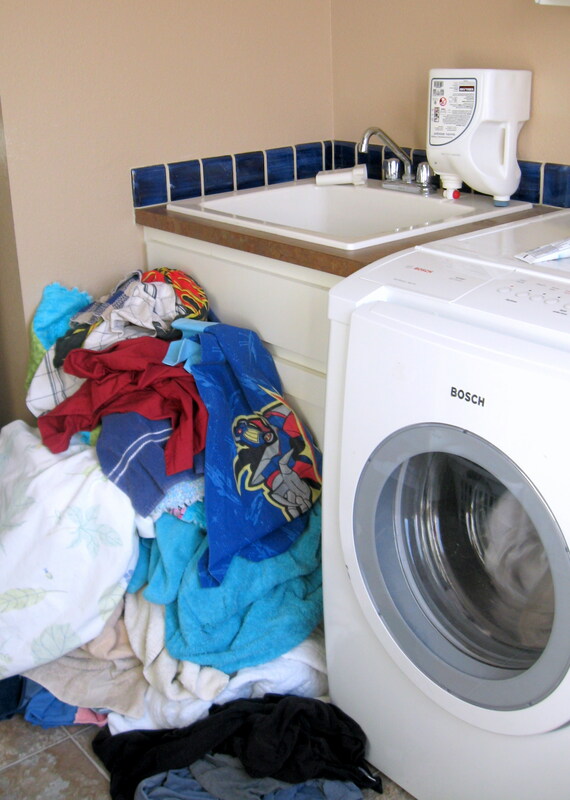 When the dirty pile is bigger than the clean pile, it’s time to do a load or five of wash. I may have used “system” a little loosely. Now we use a much more advanced system. I call it the Great Wall of Laundry. That’s a grid of laundry baskets with our clean clothes dumped in ’em. Yep, dumped. Each person gets a “bottoms” basket and a “tops” basket. 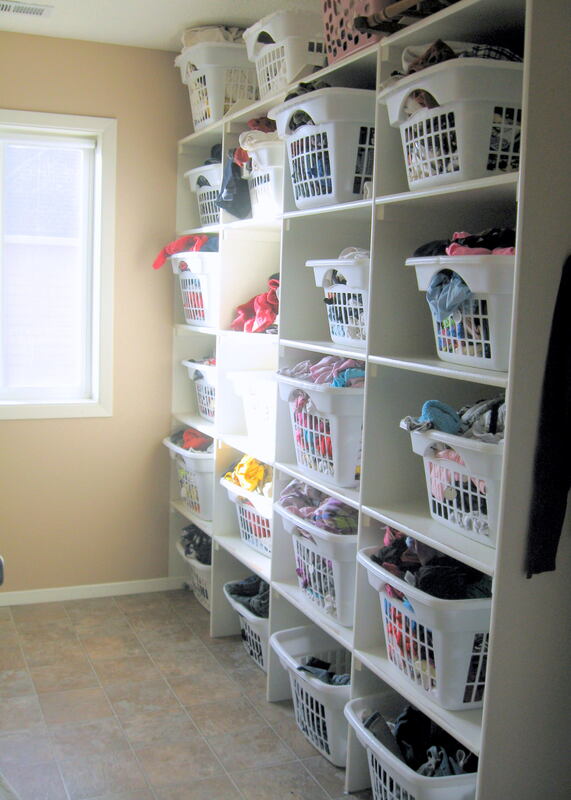 We also have baskets for dance clothes, grown-out-of-’em clothes, white socks, colored socks, and kitchen stuff. Fine. I admit it. It’s a glorified Clean Pile. But glorified is good, right?? Laundry comes out of the dryer and goes straight into the baskets. Bypass folding. Bypass dressers. Bypass aggravation. Amazing things happen when you just admit stuff. Admission: I’m never going to look good in shorts. Conclusion: Never wear them again. Admission: I’m never going to fold or put away laundry. Conclusion: Never do it again. Granted, the new system isn’t without its flaws. Namely, we didn’t make a large enough grid. We thought we could still be responsible to fold towels and sheets and put them away in the linen closet. Yep. That’s a bona fide Clean Pile right there. Or, as I like to call it, a Teach Kids How to Fold Stuff and Put It Away Pile. Do what I say, kids, not what I do. Isn’t it the dream of every parent that our children will grow up to be better than we are? Listen closely, Kids. If you’re very lucky and you obey your Mommy and you eat all your vegetables, someday you can grow up to fold laundry AND wear shorts. This is the most amazing thing I have ever seen in my life. I have seven kids and there is laundry EVERYWHERE. I dont think I could even fully explain the catastrophe that is our laundry… Think of the biggest pile of clothes you can imagine and multiply that by ten and then drop those piles in various places of my home. This is my new project. My husband is NOT handy, so I will be begging my father to help me with this very unorthodox idea of creating a place to put all my unfolded laundry. My parents will be aghast. This is going to be great! My parents, too, will be aghast. And I’m excited about this probability. New (ish? She’s 8 months, already) member of the mom of 5 club and this just revolutionized my life! Aghast in all the right ways. May I ask where you got these shelves from? Did you design them yourselves? I did not realize that we could choose to not do something we have been taught to do our whole lives. Why the hell didnt i think of this??? It’s so simple! That would leave a lot of extra space in their closets for whatever the hell isnlaying around their rooms! Backpacks, football equipment baseball equipment! . The ideas a pouring in, but my OCD is kicking in and I’d have to find a way to make sure it stayed organized so i can find exactly what i need when i need it. What are the dimensions for your grid? I have to have one! Thank you! our baskets stick out a hair at the handles, and have 3-6″ between the top of the basket and the shelf above, and 1-3″ on the sides. We ended up with two sizes of baskets. Love it. The only thing I would add are some “s” hooks to hang mesh lingerie bags filled with each person’s socks and underwear. Yep, washed and dried after each person fills their bag. Oh my goodness where have you been my whole life I’m a single mom of four in drown in kids every day in the last two post I have read on your blog have made life so much Flippin easier you are God sent!!! Best. F*cking. Idea. Ever. You are my hero. Thank you. Where did you get that shelf? Best idea ice ever had: buy one big& tall hamper/basket for each person in the family, + 1 for whites and 1 for towels. When the basket is full, do that load, unless the basket owner is above the “age of accountability”, in which case he/she will do his/her own load…maybe. Either way, the laundry stays sorted by person through the entire process: hamper to washer to dryer to whatever comes next. Whites are the only load to be sorted. I must be doing laundry wrong because my clothes wrinkle in the time it takes me to get them out of the dryer and bring them upstairs. Please tell me because this is genius and would save me a good hour+ each day! You, my dear, are a Saint. I found your post through Pinterest while trying to figure out what to do with my large laundry room (covered in unglorified piles from my 5 kids, myself and my husband.) This is going up today! My life has just been made simpler….Now where to put those pesky (always-empty) dressers? That must have been awfully fun checking out at the store with. n 20 laundry baskets. 🙂 ghed when I told d him about our “sock bininstituted before I was 5 & continues ise to this day (sometimes I’ll bring my strays over there & match them), but now I feel like I’m in good company. You are so my new favorite person! I was about to go out and buy dressers for both of my boys as the systems we have aren’t working. Instead I think I’ll just go buy 4 laundry baskets! I just found your blog last week. I started at the beginning and am having a great time going through it! Thank you for making me laugh!